Mort Kunstler Hand Signed and Numbered Limited Edition Canvas Giclee:"War is Hell!" Size: 16" x 26". 19" x 31", 24" x 39" and 32" x 52"
Edition: Artist Signed and Numbered, Limited Edition to 197 total editions. COA included. About the Art: Historical Information In a speech after the Civil War, Gen. William Tecumseh Sherman said, "There is many a boy here today who looks on war as all glory, but, boys, it is all hell." Over time that has been shortened to "War is hell." Few people would know better than Sherman, for it was he who brought the hellish torch to the Deep South in 1864. Like Sheridan's scorched-earth policy in the Shenandoah Valley, Sherman's view of war dictated that the conqueror consume, burn, or destroy anything that might contribute to the enemy's ability to wage war. He realized that this included the destruction of civilian property as well as military assets, which would debilitate the South and facilitate a Union victory. 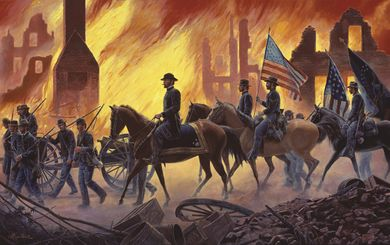 Mort K�nstler's Comments Because the burning of Atlanta has been immortalized for many people in the film version Gone With the Wind, I was drawn to place this scene in that context. I began by placing Sherman on horseback, looking back at the city in flames from a rise in the countryside. Then I remembered his famous quote and thought about hell and decided to dramatize the scene by making it fiery. After many sketches, I decided to use the fire as my main light source. Unfortunately, I knew of no way to include Sherman. That is, until I took another look at Burke Davis' book Sherman's March to the Sea. I learned that on the night of November 15, as the fires raged, the Federals began leaving the city. How could I place Sherman in the picture when he did not leave until the next day? While some thought that he was watching the fire from his headquarters, further research indicated that he was in the street, directing troops in extinguishing the fires that threatened private homes. With this information, I chose to depict Sherman with his troops in the city. The raging fires provide drama and light, while the scorched remains of chimneys, nicknamed "Sherman's Sentinels," give mute testimony to the devastation. The keys to this painting are of course, the lighting effect in the background and Sherman in the center. The general's determined personality is suggested by the jaunty angle of his ever-present cigar. The final painting includes the elements of the burning of Atlanta, dramatic lighting, Sherman, and units of his army. It is as close as I could come to portraying "Uncle Billy's" most famous quote: "War is hell!"